Fanclub is Mike Lee, Leslie Crunkilton, and Daniel Schmidt from Austin, TX. Mike and Leslie immediately knew they wanted to craft songs driven by their love of all things twee, indie, and dreamy. What they didn't expect was that the songs would come out as the most mature and dazzling things they've ever worked on. What they also didn't know was that Fanclub would give us a distinctly new sound that is also so incredibly nostalgic. On the heels of their debut EP release with already over half a million streams, they want to further craft songs that find hope in the melancholy and bring that same sentiment on the road. With more and more tour dates being announced, hopefully you'll get to see for yourself. "Influences dating back as many as 40 years make their way into the mix — the synth-pop of the early '80s, the smeared-out shoegaze of the early '90s, the twee bedroom pop that's taken off in the Internet era, and so on — but they're all in service of hooky, timeless pop songwriting and the charming vocals of Leslie Crunkilton"
"bedroom pop extremely reminiscent of the late 2000s/early 2010s blog buzzbands like Wild Nothing or Twin Sister." 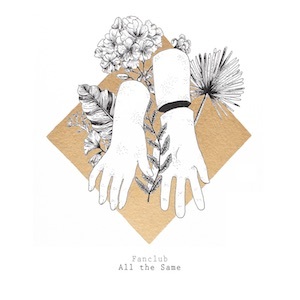 "With their debut EP, Austin trio Fanclub round out a handful of much-posted singles in 2018." "feels indebted to a lot of great 80s indie rock and giving their own fresh energy to make it feel new again." "upbeat rhythms, retro sounding synths and the occasional telecaster melody breaking through like a ray of sunshine."